You use Light-O-Rama Hub to combine the programming of a MotionPak with an existing LOR Sequence store sequence. If you have not made any changes to your sequences or props purchased from Light-O-Rama, the process is very simple. 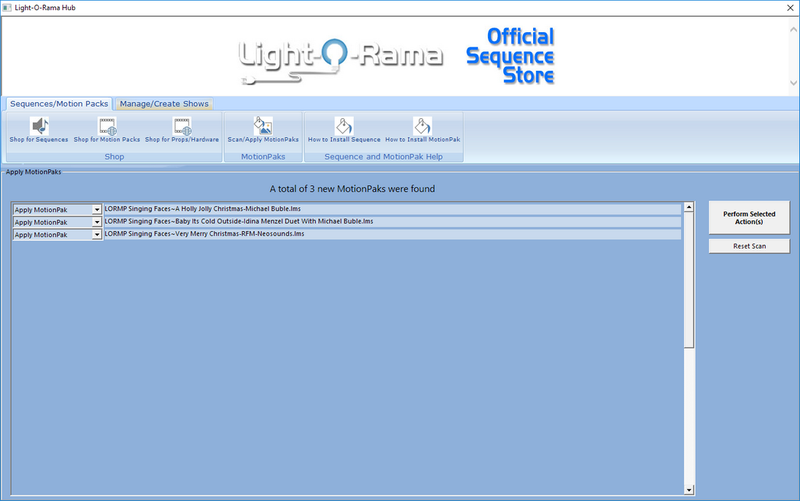 First, be sure that your Light-O-Rama base sequences (the files with the main programming for a sequence) are all in the Light-O-Rama Sequences directory. Next purchase and download the MotionPak(s) you would like for the sequences you already own. 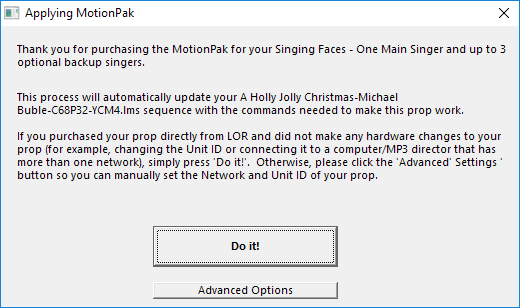 You can always purchase a new sequence and then install a MotionPak. 3.Don't Ask Again - Does not update the base sequence, and the Motion Pak will not re-appear in a scan. See Reset Scan for why you may need this option. If you did not make any changes to your LOR Prop or LOR Sequence, simply press 'Do It!'. Your Sequence will be updated with all the commands from the MotionPak, and the job is complete. If when applying a MotionPak Hub finds more than one sequence that could be the base sequence, you will be asked to select the correct one. In this case, there are 4 sequences in the Sequences Directory that are matching up to the MotionPak. Please select the correct one and press the OK button. If you need to change the default settings of a MotionPak, for example you changed the Unit ID of the prop, press the 'Advanced Options' button. Here you can change the network and unit ID of the MotionPak to match your hardware.